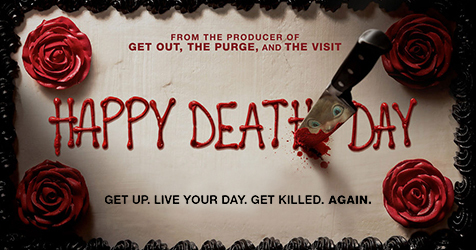 Happy Death Day is a PG-13 horror movie. It’s produced by Blumhouse. It was directed by the man behind the middle four Paranormal Activity movies. And yet, in spite of all these things, I’m happy to report that this is actually a pretty solid movie. The comedic slasher film (and surprise box-office topper) breaks up the standard “teen-blonde-gets-killed-by-a-spooky-masked-killer” premise by having the protagonist loop back in time. She must repeat the day of her murder over and over again, Groundhog Day-style, until she’s able to figure out who keeps killing her and why. This is a very self-aware movie, satirizing our expectations of how teen slasher films work with generally amusing results. It’s by no means a game-changer like Wes Craven’s Scream, but it succeeds in being a sneaky parody of the horror movies that came before it, which I greatly appreciated. There were several sequences in the film where I was genuinely caught off guard, and had no idea where the plot could possibly go next. They knew what I, a horror film junkie, expected them to do; so they mockingly did the opposite to hilarious effect. It was the moments like this that reminded me of 2013’s You’re Next, the last horror satire that surprised audiences with its unconventional twists. 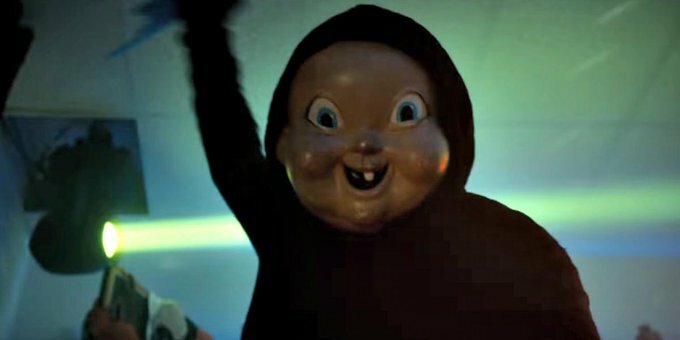 Add some teen-movie snark to the dialogue, and you have Happy Death Day. If you’re thinking “Wow, that sounds exhausting”, you’re pretty spot on. Pacing-wise, this movie doesn’t slow down. It has a lot it wants to do, and goes for it with a pretty relentless force. Whenever there was a seemingly slow or predictable moment, it was always the setup to an outlandish punchline, be it a ridiculous kill or a totally unexpected plot twist. They even address the inevitable Groundhog Day comparison in a clever way, letting us in on the fact that they know their own gimmick. Which brings me to my main problem with the film. In Groundhog Day, Bill Murray is a jerk, but the rest of the world is pretty average. Boring and annoying, but nothing out of the ordinary. This gives Murray’s character a contrasting backdrop to play off of, and makes his “I’ll-stop-being-the-worst” arc easy to latch onto. It also does a very good job of letting the audience know we’re never going to get a firm explanation of why or how his time-warping is happening. We just accept it and go along for the ride. In Happy Death Day, unfortunately, the characters are all terrible people, and the rules of her murder-cycle are rather ambiguous and undefined. The moments where they explain the details of how she keeps reliving the same day only provoke further confusion. I give a ton of credit to lead actress Jessica Rothe’s performance. She pulls everything she can out of every moment, both spooky and silly, and makes it fun to hate her as she selfishly abuses everybody in her life. The problem there though is that she has other selfish jerk characters around her, so it often times comes off as one-note or annoying. It took me a good 15-20 minutes before I adjusted to a world full of uppity sorority girls who all secretly hate each other. When there’s no contrast, the comedy falls flat. Although he was an obvious plot device and exposition machine, I appreciated Rothe’s scenes with her male co-star Israel Broussard, as it gave her someone worthy of bouncing her sarcastic jokes off of. While there are pretty big problems with the basic structure of the movie, they don’t detract too much from the overall fun and inventiveness of Happy Death Day. It’s a familiar concept, but still entirely its own incredibly strange movie. It’s a very special brand of odd that I haven’t seen in a mainstream movie for a very long time.